Dry, sure, but dramatic too. The trail climbs after leaving Hwy 3 at Scott Mountain Summit. Tall Jeffrey Pine ahead. That bark smells like butterscotch. And I love those low, down-turning limbs. Oh, Jeffrey! After the hot, dry terrain we crossed in the few miles between the boundary of the Trinity Alps Wilderness and Hwy 3, I did not have high hopes for the scenery on the other side of the road. The slopes we could see were yellowed with only a few trees, and the afternoon sun was hot. A billowing cloud of smoke was visible in the not-too-distant distance as we crossed the pavement, so it seemed that the hot and windy weather was not helping the Gap Fire. We had a steady but not difficult climb ahead of us, with another 6 miles to the first water source and a few miles beyond that to where we could camp. Once again, the trail surprised us with its beauty. After a short distance paralleling a dirt road and a few switchbacks up an exposed grassy slope, the rest of our evening miles were through a forest of stately Jeffrey Pines on a slope dotted with red rock and covered by manzanita and dry grasses. The Jeffrey is one of our favorite trees, with its stout trunk and red, butterscotch-scented, deeply grooved "puzzle" bark. Its hallmark thick limbs often twist and knot around each other, sometimes turning sharply downward so that even near the ground there will be a limb that is 8" across or larger. Their crowns are often blunted so they make a dramatic silhouette against the sky and in the early evening light they were the perfect accompaniment to our hike. We have gotten in the habit of cooking and eating dinner, and filling our water for the next day, at the last reliable water source. This rarely seems to coincide with a campsite so we then hike the final miles post-dinner and often arrive just around dusk. Day 56 was no exception, and we made the last 2.5 mile traverse along the lightly forested slope as dusk fell. We reached the saddle near the junction to Coopers Meadows just in time to select the flattest spot for our tent, and see the smoke settle into a thick haze in the valley to the north. We set up our tent by headlamp and were treated to a sky full of stars and the clearest view of the Milky Way we have had so far on this journey. The Milky Way from near our tent. If you follow Macro's IG feed this will be a repeat, but it was too good not to include here too! On Day 57 we awoke to a much hazier sky, and the smell of smoke was thick as though we had closed the damper on the fireplace before the embers had completely cooled. We had two gradual climbs to elevations over 7000' today and hoped to get some decent mileage in, so we made an early start. Knowing there were no wilderness areas until right around Castle Crags, we weren't sure what to expect from the next 50 miles. What we found was an endless traverse through constantly stunning scenery under an amazing sky, with temperatures that were much more pleasant than we have gotten used to over the past several weeks. In retrospect, we think of Washington as glaciers, wildflowers, and all types of weather (though mostly wet). Oregon is the land of lava, lakes, and heat like a blast furnace. Northern California is shaping up to be characterized by rock, trees, and skies. We continued to have intermittent views of Mt. Shasta, and of the smoke from the Gap Fire, to orient us as we followed the contours of many adjacent slopes with the Trinities growing ever more distant. We transitioned through several slightly different forest types, though the predominant one was that of Jeffrey Pines, manzanita, and red rock with patches of Incense cedar and tall bear grass mixed in. Once we crossed the Parks Creek Road and started a more steady climb we transitioned into slopes of decomposed granite, sage, and deer brush. Yet despite these generally arid conditions we crossed several streams and springs surrounded by corn lilies, lush green grass, and blooming wildflowers. We passed large, blue Deadfall Lakes then continued our climb across a slope of brilliant white granite talus through a forest of Douglas fir and the higher-elevation mountain hemlock along with our friend the 5-needled Whitebark pine, then turned a corner to find ourselves surrounded by nearly exclusively Red fir. These massive beauties with their deeply grooved nearly maroon-colored bark were a favorite of John Muir, and it is easy to see why. The sky had been blue other than the distant smoky haze, but clouds started to build in the early afternoon and made a perfect backdrop to the majestic trees. We crossed into a new basin beyond the Sisson-Callahan junction and suddenly had our clearest and closest views of Mt. Shasta across a broad valley, with a smattering of clouds but otherwise deep blue sky. The trail cut a narrow rocky path along a gradually ascending traverse around the basin, past deep jasper-red rock cut by veins of quartz. Above 7000' we found ourselves surrounded once again by ancient Foxtail pines, close relatives of the Bristlecone pine which is the oldest living thing on earth. The 5-needled Southern Foxtail pine is unique to California and found in the Sierra Nevada only at the highest elevations, preferring stark conditions above 12,000' in elevation. Before we saw them in the Trinities yesterday, we didn't realize that there is also a Northern Foxtail Pine whose range includes a few higher-elevation areas in far northern CA. Like its more-familiar cousin, the branches are covered by characteristically thick clusters of needles that look like a bottle-brush or foxtail, and the shape of the tree is often unkempt, reflecting the harsh conditions where these trees seem to thrive. I am always amazed by the massive size of their trunk and their enormous height, given their preferred environment. They are often the only living thing aside from a few alpine wildflowers, though in this particular basin they shared the stage with plenty of Whitebark pines. Generally these PCT sign-posts are set into the ground. In this case, the trail builders decided to just wedge it into a stump instead. Maybe the ground was too hard for digging? After crossing our saddle at ~7500' we lost our views of Shasta (temporarily) and our Foxtail pines (probably until the high Sierra) and made a gradual descending traverse towards huge and deep blue Toad Lake. We gained our first views of distant Castle Crags, and continued to enjoy clear skies with scenic clouds above despite the smoky haze to the north. Our dinner spot for the evening was White Ridge Spring, where we found the quintessential spring with clear, cold water emerging from a grotto just beneath the trail, directed by a metal half-pipe into an initial pool then continuing down the slope as a trickling stream surrounded by a lush margin of deep green plants that contrasted to the much drier surroundings. Springs have been the predominant water source for much of northern CA and they come in all types, but White Ridge looked just like you might see in a picture book. On top of that, it was flowing at 2L in about 15 seconds, which made the task of making dinner and filling our water containers a breeze. Our ambitious mileage goal for the day meant we had another 10 miles to hike after dinner, so we didn't linger in this sweet little spot. We crossed a dry rocky saddle with another sweet view of Mt. Shasta, then crossed to the back side of a ridge for some dramatic high traversing around granite knobs between stands of Sugar pine and Douglas fir on slopes covered with manzanita. The sun was getting low in the sky and dramatic golden-hour light infused everything with a rich glow. At a high saddle we looked back for a view of Shasta and were surprised to see it nearly completely obscured by a thick cloud of smoke that had moved in from the north. As we stood there and watched, the smoke continued to roll across the saddles and filled the valley below then obscured Castle Crags as well. We still had clear views of the Seven Lakes Basin below us as we made our final few miles of traversing towards Soapstone Ridge, but the smoke settled in over everything else like coastal fog and we completely lost our usual orienting features. We had originally planned to camp on an exposed point with views of Shasta and the Crags, but in light of the smoke decided on a spot a few hundred feet higher on the top of the ridge. We reached it by headlamp and fell into our sleeping bags, tired but happy after an amazing 32 miles today. We slept in on Day 58, knowing that our hike into Castella was just under 20 miles (a short day by thru-hiker standards), and net downhill. The smoke had lifted somewhat overnight, so we could see all of the surrounding peaks though they were silhouetted as blue ridgelines in the hazy air, with no definition of their features. We remarked that it could be the Great Smoky Mountains of TN, except that here the appearance was due to actual smoke. There was a light breeze and that helped cut the smell a bit. Our hike was generally pleasant, though dry with no on-trail water for the first 10 miles. We traversed alternating granite, decomposed granite, and dusty slopes as we wound our way to and then around the base of the dramatic Castle Crags. With the hazy air we didn't get the full effect of their rocky features but they still made an imposing companion directly above us. The trees were the usual suspects, with stretches of Jeffrey and Sugar pines, and nearly constant Douglas fir. The dry slopes were covered by manzanita and as we dropped in elevation we started to pick up a mixed forest with several deciduous species and even poison oak. We made our way to the campground at Castle Crags State Park, a generally non-descript spot adjacent to I-5 but conveniently located to our Castella resupply and a bargain at $3/hiker/night including unlimited hot showers. We met a few SOBOs who had been lingering in the area for a few days with a plan to hike out tomorrow, and headed over to the store to pick up our resupply box and care packages from several friends (thank you! these mean the world to us and are thoroughly appreciated & enjoyed!!). It's been an amazing nearly 60-mile stretch of non-wilderness hiking. 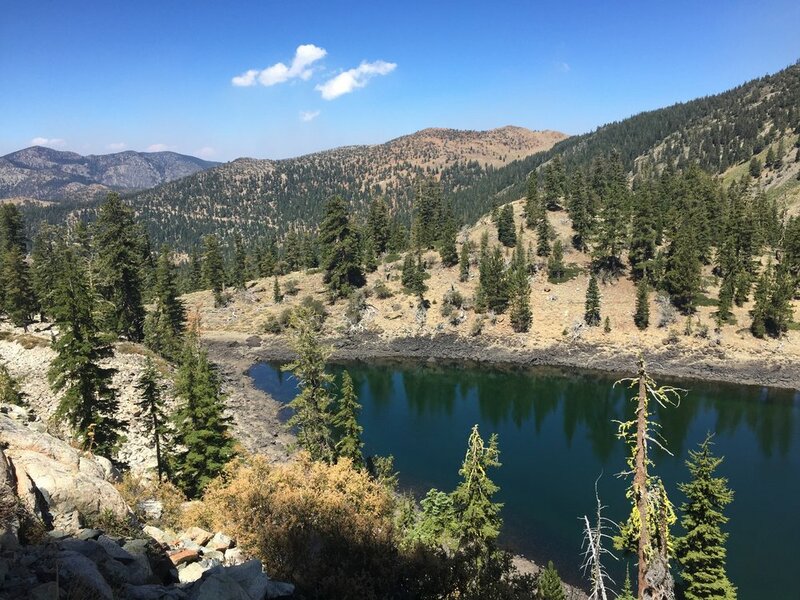 We've found several areas that are on our list to visit on future backpacking trips, and Northern California is turning into a much more scenic stretch of the PCT than other hikers might lead you to believe. We are looking forward to seeing Mt. Shasta recede into the distance as we head south and east tomorrow towards Burney Falls and the infamously hot and dry Hat Creek Rim. I'm sure there will be plenty of natural beauty along the way.